Demo stock. 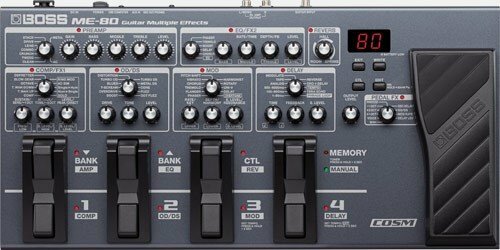 Mobile, battery powered, and filled with a diverse selection of flagship-quality BOSS amps and effects, the ME-80 is the ideal compact tone processor for performing guitarists. A friendly knob-based interface makes it simple to dial in great sounds in seconds, while easily selectable operation modes offer the flexibility of individual stompbox-style on/off or instant recall of complex multi-effects setups. Unique new footswitches deliver twice the control of previous designs for efficient and intuitive effects switching, patch selection, and real-time sound shaping while playing on stage. The free BOSS TONE STUDIO software unlocks even more tonal possibilities, providing a cool graphical interface for tweaking and organizing sounds on your computer, plus a web connection to BOSS TONE CENTRAL for direct access to free gig-ready patches created by top pro guitarists and much more.